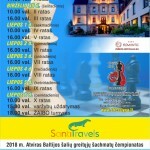 31 st International chess festival Panevezys Open 2018 take place in Panevezys city Lithuania from 29 th June to 06 th July 2018 and there will be held some tournaments. ELO >2200 with a possibility to get GM, IM , WGM and WIM norms in 10 rounds with classic control 90min./40 move + 30 min. + 30 sek. per move. Next Panevezys Open 2018 will be held for all players until ELO <2200 and will be rated to classic ELO too.